Probashbangla24 online Desk : Scotland’s pro-independence leader vowed on Monday to vote against any Brexit agreement that fails to preserve much closer EU-UK ties than currently under discussion. First Minister Nicola Sturgeon said British Prime Minister Theresa May was offering a false choice between a “no-deal Brexit and a no-detail Brexit” — a fudge that leaves major issues unresolved. “Other options are available. 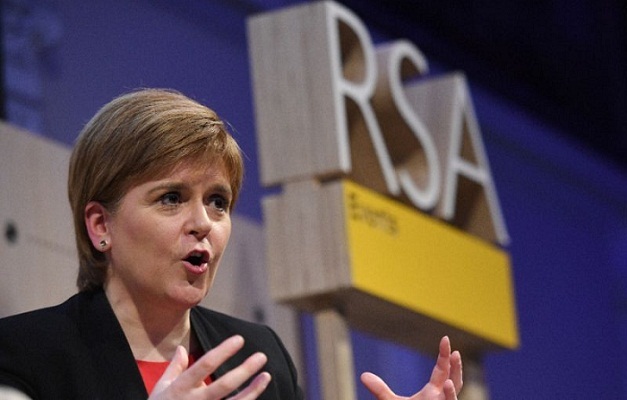 Voting against a bad or blindfold deal isn’t a vote for no deal,” Sturgeon said in a keynote address in London. Negotiations before this week’s crunch summit in Brussels hit a roadblock on Sunday over ways to keep the border open between EU member Ireland and the British-ruled Northern Ireland. May’s solution would effectively keep the UK in the EU customs union for a set post-Brexit transition period. The arrangement would see Northern Ireland also stay in the EU single market — a broader mechanism that streamlines various regulations across the bloc. This would cause disparity between Northern Ireland and mainland Britain, requiring some form of border checks between the two, despite being part of the same country. Northern Ireland’s pro-British DUP party, which props up May’s ruling coalition in Westminster, bitterly opposes such a settlement, believing it a step towards the unification of Ireland. The EU wants May’s temporary solution to have a permanent fallback option. Sturgeon said her proposal would resolve the Irish border issue by making the territory’s rules reflect those of Britain. She said eurosceptics in May’s cabinet and party falsely argue that close EU-UK ties go against the spirit of the referendum that set Brexit in motion in 2016. “The referendum outcome was not a mandate for a hard Brexit,” said Sturgeon. Both Scotland and Northern Ireland voted to remain in the EU. Sturgeon promised to outline plans for a possible Scottish independence referendum after details of any Brexit agreement reached over the next month are published. Nationalist passions drove Scotland to hold such a vote in 2014. It ended with people choosing to stay part of the UK by a decisive margin.